The Jefferson Cottage is a charming cottage with one bedroom + Loft tucked in a quaint and quiet neighborhood in Bend's popular Old Town District. The location of the Jefferson Cottage is exceptional! Walk to Jackson's Corner or down to the river trail. You are in walking distance to all the popular shops, restaurants, and pubs in downtown and in the Old Mill District. Hop on one of the 2 cruiser bikes provided and explore Bend like a local! You will find so much to enjoy in this charming cottage! There is a queen bedroom on the main level and an enchanting loft with a queen and a twin bed for your extra guests. Great for kids! There is an additional sleeper sofa in the living room with linens provided. Hang out on the large back porch, watch a movie on the HDTV or cozy up with a book in the bright and sunny living room. There is a gas fireplace in the dining room, and sit-down dining for 4. Prepare a home-cooked meal in the fully equipped kitchen with granite countertops or relax and cook out on the gas grill on the back deck. All Bluebird Day Homes proudly feature super-comfy beds with European style bedding including high thread count sheets and fresh, clean duvet covers. The home is equipped with a washer dryer, HDTV, cable, DVD player, free wireless internet, games, toys, and much more for you to discover! If you prefer to get out into nature, there are plenty of hiking and mountain bike trails just minutes from town. Mount Bachelor Ski Resort, the spectacular Cascade Mountains, and many lakes are an easy 20 - 25 minute drive. • Loft is great for kids! • Fantastic location! Walk Everywhere! Couldnt have asked for a better place to stay than at the Jefferson Cottage. Excellent location where we walked everywhere we needed to go. A perfect abode for the two of us. Found everything we needed in the kitchen and the fireplace was super cozy. Would recommend this place to family, friends, and others. Staff was prompt to make sure we were having a great stay (which was a show of their excellent customer service). Great place. Terrific location, comfortable, and well-appointed. Would stay here again!! The cottage is located in a perfect spot and really has everything you could possibly need during a stay in Bend. Its located within a short walking distance to downtown Bend and all it has to offer, as well as to the Old Mill District and the multitude of walking paths that encompass the area. If you dont plan on venturing outside of Bend then you really dont need to drive at all. Just park your car and enjoy! As for the house itself, it was clean and quiet with all of the amenities you would ever need. The neighborhood is also safe and quiet. Well definitely be back! The Cottage was perfect for our family. Its in a quiet neighborhood with a short walk into downtown shops and restaurants. Our favorite eating spot was a mere block down the street. The washer and dryer were a bonus. We loved out stay. Wonderful location and cute little house! This house is just as described. You really CAN walk everywhere. Comfortable furniture and bedding, a well-stocked kitchen and modern appliances make this house feel just like home. Great location, walking distance to fabulous shops & restaurants. Very cozy & comfortable cottage. It was a pleasure to stay! Very nice home a few blocks away from downtown bend. This was my second stay in a bluebird day vacation rental. They have been the cleanest rentals I have stayed in. This home was great for a couple and was in a quiet neighborhood. Parking was available on a small driveway in front of home for extra piece of mind. The kitchen was well equipped with updated washer and dryer in a sunroom just off the kitchen. 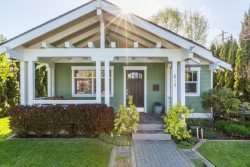 The home has craftsman charm from the 1920s and 30s. My girlfriends and I finally scheduled a visit to see a friend who had moved to Bend 10 years ago. We stayed at the Jefferson Cottage through BlueBird vacation rentals and absolutely loved it. The house is located in a great location walkable to downtown and to other local favorites. The house is well maintained with an upgraded kitchen, a full size washer and dryer in the laundry room, bicycles with helmets and a lock to borrow, and dome little extras that make a vacation rental memorable. We would recommend this vacation home to anyone looking for a taste of what a nice, quaint, centrally located home in Bend, Oregon has to offer. Honestly the cottage was perfect. Clean, modern, hosts were terrific!! Cute little house in a super convenient downtown location. Was able to walk everywhere we wanted to go (downtown, Old Mill District, Les Schwab Amphitheater...)! It was super hot while we were in Bend but the A/C worked fine and the fan in the bedroom was a saving grace. Having breakfast on the deck every morning was nice too. This was the perfect rental for us! We stayed Wednesday thru Saturday (wishing we had more time to stay in Bend). The Jefferson Cottage is a bright and airy one bedroom that has everything you could ever need. I was super impressed with how well the kitchen was stocked. The bed/bedding was comfortable, the rental was very clean and neat. The bikes would have been great if we had a longer stay, we definitely would have used them. The back deck is spacious with chairs, a bench, table and a grill. We could not have been happier with Bluebird rentals. We will (and have already) recommended this to a few of our friends, and we are planning a trip back next august...this time staying in Bend for a full week! Excellent location! Our family enjoyed our quick walk to Jacksons Corner for dinner --one of our favorite places for dinner. And Bluebird Day was extremely fast getting back to us when we had questions. Thank you for everything! The cottage was perfect for our get away as a couple. Very comfortable. The kitchen had great supplies and appliances. One of the best parts was being within walking distance of both the old downtown district and the river parks. This neighborhood is within walking distance to all of the best spots in Bend. We parked our car upon arrival and never got back in it until we left. We were contacted by the owner but we never needed to reach out to them. The home is well stocked, the coffee provided from a local shop was a plus! The deck in the back is perfect place for morning coffee or an afternoon siesta! The bed was comfortable and the home was the perfect size for the two of us. Although we never got on the bikes, we thought it was great that they were available. We loved that we were within walking distance (or biking distance) to the Mill District/Deschutes River and to downtown! Also loved how easy it was to get out of town to the Cascade Lakes! The house had everything we needed and we enjoyed the neighborhood. We would come back and stay again at Jefferson Cottage! Great location, easy walk to downtown. House was clean and had all the amenities. Would definitely recommend staying here. We will return to Bend for a lengthier stay, and we will rent this cottage again. It is perfect for two people and is conveniently located. It was exceptionally clean and the kitchen was well stocked. We had both warm and cool weather during our 4 day. Ventilation and gas heat worked quite well. This was our first trip to Bend. We had hoped it would be sunny so we would be able to go out an enjoy the great outdoors, but it was pouring down rain with thunder and lightening nearly our whole trip. We felt lucky that we had chosen such a cute rental for our trip, seeing as how we spent much more time inside than we planned on! The home was very clean and nicely decorated. The location was excellent, very close to the river trail and walking distance to downtown and 10 Barrel. We appreciated having the bikes even though we didnt get to use them, they looked to be in good condition. We hope to be back, and would definitely recommend this little home for anyone else needing a nice getaway. My wife and I really enjoyed our stay. The cottage is super cute, clean, and conveniently located. You can walk just about anywhere downtown and yet it feels like a nice quiet neighborhood. I would definitely recommend this property to anyone looking to spend time in downtown Bend. What a fantastic house. Right in Old Bend. Will definitely be back!